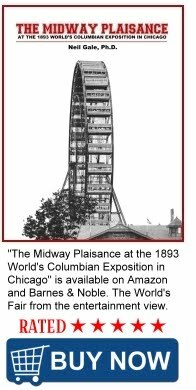 The Digital Research Library of Illinois History Journal™: The Pledge of Allegiance was written for the Chicago World's Columbian Exposition of 1893. The Pledge of Allegiance was written for the Chicago World's Columbian Exposition of 1893. The Pledge of Allegiance was written for the Chicago 1893 World's Columbian Exposition to honor the 400th Anniversary of Columbus' Landing in the Americas in 1492. Many people don't know that the Pledge of Allegiance came out of the Chicago World's Columbian Exposition of 1893. The Pledge of Allegiance was written in 1892 by Francis Bellamy (1855-1931), who was a Baptist minister and a Christian socialist. In 1891, Daniel Sharp Ford, the owner of the Youth's Companion, hired Bellamy to work with Ford's nephew James B. Upham in the magazine's premium department. In 1888, the Youth's Companion had begun a campaign to sell American flags to public schools as a premium to solicit subscriptions. For Upham and Bellamy, the flag promotion was more than merely a business move; under their influence, the Youth's Companion became a fervent supporter of the schoolhouse flag movement, which aimed to place a flag above every school in the nation. Four years later, by 1892, the magazine had sold American flags to approximately 26,000 schools. By this time the market was slowing for flags, but was not yet saturated. In 1892, Upham had the idea of using the 400th anniversary of Christopher Columbus reaching the Americas to further bolster the schoolhouse flag movement. The magazine called for a national Columbian Public School Celebration to coincide with the World's Columbian Exposition. A flag salute was to be part of the official program for the Columbus Day celebration to be held in schools all over America. By June 29, 1892, Bellamy had arranged for Congress and President Benjamin Harrison to announce a proclamation making the public school flag ceremony the center of the Columbus Day celebrations (this was issued as Presidential Proclamation 335). Subsequently, the Pledge was first used in public schools on October 12, 1892, during Columbus Day observances organized to coincide with the opening ceremony of the World's Columbian Exposition in Chicago, Illinois. The fair's construction process was slow, in fact, the enormity of the task at hand forced Daniel Burnham and the commission to push the opening day back from late 1892 to May, 1893. The commission decided to keep the 400th anniversary date to celebrate Christopher Columbus and the up comming World's Fair which opened May 1, 1893. The Bureau of Education liked the idea so much they printed massive quantities of the pledge and mailed copies to virtually every school in the nation. 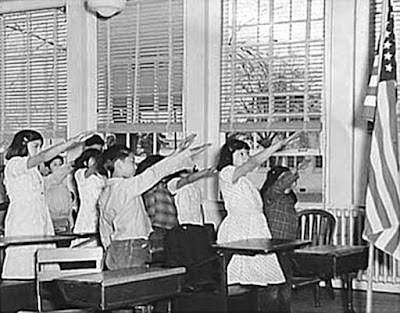 The children and adults saying the pledge at the moment of the dedication were to show respect for the flag by giving that symbol a gesture that came to be known as the "Bellamy salute." The gesture involved stretching the arm out toward the flag as the pledge was recited. The practice of reciting the pledge caught on quickly with educators and the public in general. Soon it was a regular part of a student's school day. It was also recited at civic ceremonies and all national celebrations. During World War II, the salute was replaced with a hand-over-heart gesture because the original form involved stretching the arm out towards the flag in a manner that resembled the later Nazi salute. 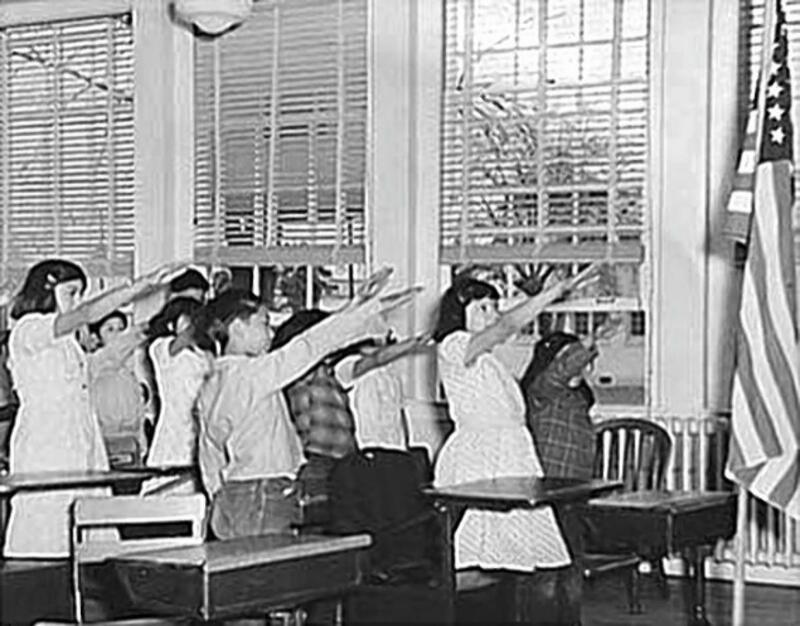 The Bellamy salute was officially replaced by the hand-over-heart salute when Congress amended the Flag Code on December 22, 1942. The Pledge has been modified four times since its composition. John W. Foster, Secretary of State.